I have a higher resolution version of the corrected picture, but Spanish upload speeds are 0.05Mbps. Another one just turned up on ebay if you are interested. Bumped into this NA at the recent Old Buckenham Airshow. The chap in the green shorts is the owner and an ex employee. He told me he must have made the chassis to my S2 as he had a hand in all of them for the second run at the factory. Probably told me his name but I can't remember it now. Any advice welcome on trying to find this one. Looky looky here, coming up at the Classic Car Show COYS auction London Excel centre 16th Feb. I managed to work it out some time ago, I located a few photographs of her getting collected by the original owner (this included the full ‘N’ Reg number plate), but the current owner didn’t wish for any one to know these details. 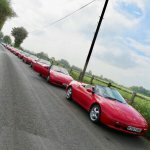 Did anyone else receive an Email yesterday from CL entitled "The 50,000th Lotus Reappears...."? Attached was a document containing details and photos of the car. Unfortunately it also contained the names and addresses of previous owners, so I don't think it can be shared on a public forum. How would we stand if I edited it to remove those names and addresses and posted it here? It would be nice to see the announcement AND it would be very nice if you omitted the personal details. You could list them as owner #1 and any other info (years owned, etc) but no personal details. Mods please remove if it's deemed not appropriate. RonR wrote: Did anyone else receive an Email yesterday from CL entitled "The 50,000th Lotus Reappears...."? Another one for Clemo's stable ?? Or Specky's ? ?